Strawberries are the first fruits to ripen each year. It’s the taste of spring. During this wonderful season, these juicy heart-shaped berries are abundant and can be enjoyed fresh by everyone. This is the season to make all the strawberry recipes that you can. Enjoy every flavorful moment of the season with these tried and true strawberry recipes. When you make this recipe you’ll have two of your favorites in one bite – creamy chocolate and juicy strawberry. Dip those lovely red berries in milk chocolate or white chocolate and even add some nuts, too, because why not, they’re oh so good and oh so easy to make. If you are a pretzel fan (or even if you are not), this Strawberry Pretzel Dessert will not disappoint. Who knew strawberries and your childhood favorite pretzel go well together? Try it! Wish you could have strawberries year round – make jam and make it more special with rhubarb. The sweetness that you crave will be available anytime in a bottle of Strawberry Rhubarb jam. Moist, foamy, creamy, fresh, simple, pretty, heavenly. What can I say more, that’s exactly what a Strawberry Trifle is like. Drinker or non-drinker, no doubt you will be addicted to the Drunken Strawberry Crepe. Have a blast and enjoy them every breakfast. Enjoy strawberry season all year long when you make and freeze extra batches of this strawberry jam recipe. Salivating for something crispy and fresh? Grab your chips and start chopping some strawberries, red tomatoes, and garlic for a funky Strawberry Salsa. Everyone will agree that strawberry is a power ingredient that makes every breakfast meal the bomb. This Strawberry Cream Cheese French Toast recipe is bursting with creaminess and sweetness in one. How do you taste summer? Let me tell you how. Bring out your frozen strawberries, pineapple, and banana and grab your blender and make your Strawberry Pineapple Banana Fruit Smoothie. Enjoy each layer of this Red Velvet Vanilla Strawberry layered cake any day or in any celebration. Making this delicious and beautiful cake is just a piece of cake. This easy step-by-step recipe of Strawberry Roll Cake will truly wow you. Whisk, mix, bake, and roll, then eat it any day. Here’s something sweet and pretty for the perfect birthday party. Young and old will be thrilled to take a bite of these Neapolitan Cupcakes with strawberry frosting. Lemon curd is one of the perfect partners of strawberries. Though it may take a day before serving, surely this Strawberry with Whipped Lemon Curd is worth the wait. The French are expert crepe makers but you could be one, too. Wow your mother or your girlfriends on a brunch date with Strawberry Balsamic Glazed crepes. When it’s strawberry season you should not miss the all-time favorite dessert –Strawberry Shortcake. What can I say; nothing beats the classic. Take fresh strawberries and dip them in caramel with a hint of salt then roll them in dried nuts of your choice, and viola! You’ll have perfect Salted Caramel Strawberries. 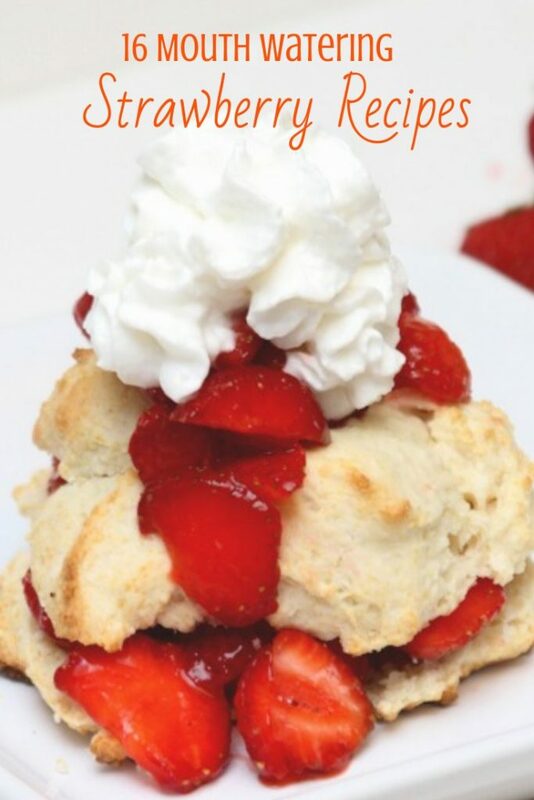 Pin All These Fabulous Strawberry Recipes to Pinterest!